Fights wrinkles and loss of firmness. 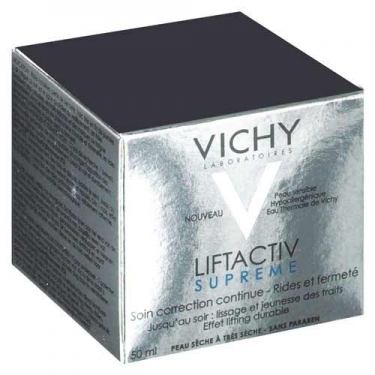 DESCRIPTION: Liftactiv Supreme Soin Jour Peaux Sèches from Vichy is an anti wrinkle day care for dry and sensitive skin. Formulated with Rhamnose, Caffeine and Adenosine with immediate effect brightens and smooths wrinkles and imperfections. The skin stays revitalized, with a young and relaxed look until the end of the day. The texture is non-greasy, with a velvety touch. Apply in the morning on clean, dry face.